I was three years old when the Red River flooded and the National Guard told my family to leave home. I was too little to remember, but I've heard the stories all my life of mighty sandbaggers, superhero people who appeared out of nowhere like bees upon a bed of flowers to build levees, rescue neighbors, and do their best to help out under the worst conditions. My parents, it seemed, had lived through something amazing and must have become who they are now because of it. What I had to learn had never occurred to me till recently – I could be a sandbagger myself, carrying the message of my mythological ancestors who did the impossible as naturally as the Red Lake River pours into the Red at Grand Forks. As I fall asleep on Sandbagger Street, I imagine the sound of rushing water growing stronger in the yawning dawn. Rancid water bubbles up through the manhole covers in the gutters. It takes out the roads, the phones, and all hope of saving anybody’s homes. Clouds appear, dropping night upon a lightning-ripped sky. I see cracks expanding on the sandbag wall, tall structures tumbling down, water wondering where gravity will have it go now. Newsmen claim Hell has come again. Sometimes, on a real gutpunch GFunk morning, my waking thoughts are darker than what my nightmares can concoct. Memories poison my present and frame my past in disaster. Images of dead friends in my head. Christian collapsing in the grass. Evan’s dad finding him bloodied in bed. Calling an ambulance for an ex-girlfriend. Covering Alex’s shift at work because he’s dead. Vestiges of shock I thought I’d finished with. No dream is worse than the reality of Andrew Sadek, a North Dakota college student whose body they found in the Red River, with a bullet hole in his head and a backpack full of rocks. Police caught him selling $80 worth of marijuana and threatened him with up to 40 years in prison. They persuaded him to go undercover, seek out drug dealers, and participate in recorded transactions on the shaky promise of reducing his charges. When Andrew was murdered, his mother found out about his involvement as an undercover agent. Now she’s working on legislation to reform the use of confidential informants so that low-level marijuana offenders aren’t used as pawns in dangerous drug deals. Our friends at Students for Sensible Drug Policy and the UND Psychedelic Club are trying to find ways to help. Perhaps my harm reduction friends are some the new sandbaggers of today’s flood of social confusion. If so, taboo is our rising water. Mathodi puked billowing black smoke into the frosty spring break air, and a circle of sandbaggers cheered in the melt mud morning grass. A long awaited March dawn welcomed us with winded leaveless trees and crispy breakfast cold. Six of us prepared to set out on a 10-day adventure from the Red River Valley to the Colorado Rockies for camping, conversation, and sandbaggin' with friends. Mathodi is the Sandbagger News Van, a 1983 GMC Vandura "Mystery Machine" with more built-in ashtrays than seatbelts. It electrocuted our captain Gari a couple times while he tried to fix a few things under the hood. But the smell of gas in the black smoke meant Mathodi would roll. The Sandbaggerizing had begun. We sandbaggers discovered each other in Grand Forks and slowly began to let ourselves in on our people's ancestral secrets. Sandbaggers can do anything if they do it together. But most of all, they need rising water. The certainty of the road's impending challenges mattered less than the truth that we would face them together. We found ourselves moving, as though on our way to the sandbag wall to satisfy some sacred purpose. Our destination mattered none whatsoever. About 150 miles from the geographic center of North America, Mathodi and the sandbaggers pulled off a highway into star-pocked prairie darkness. Overlooking the Missouri River north of Bismarck are the ruins of a 500-year-old Mandan village, abandoned when smallpox came to the Great Plains. We walked between the earthen lodges, now overgrown mounds casting moonlight shadows on the hill, and layed above what may once have been the roof of somebody's house centuries ago. The sound of the river and the shining trillion twinkling stars experienced each other on that hillside with us as it had with others long before. We sang songs and cried laughs into the calmly night sky, which watched and offered windsong back in reply. We shared stories of friends we'd lost to overdoses, suicide, drinking & driving, house fires, domestic violence, and bad advice. I asked the young man who brought us to the Double Ditch village that night about his dreams for North Dakota. "I want to die here," he told me, "at home in the room I was born in." It's where he'll raise his family. It's where he'll work. But being at home won't mean he'll be sitting around. He intends to leave that room looking better than it did when he showed up. Mathodi hadn't made it through the Deadwood city limits before breaking down the next morning. Something near the front tire snapped as we crept up a bumpy slope into the Black Hills. Had we not been slowed to 25 mph in a construction zone when we hit the final pothole that sealed our fate, it surely would have broken later -- perhaps as we approached a sharper turn on a steeper slope a roll away from oblivion. The police who arrived to direct traffic around us were remarkably kind and pointed us to the bus stop from which we could hop on a shuttle back into Deadwood to camp. We pitched our tents in a dry patch of grass littered with thawing dog droppings and spent a bumpy, cold night in a place we never meant to be. Sometime during our 8-hour hike along the busy highway to pick up Mathodi the next day, our suspicions were confirmed. If there were any point to the sandbaggerizing, this was it. Maybe forgetting the difference between work and play could make the difference between life and death. In Colorado, we spent half our time in an international food market buying things like cockroaches and octopus that we ate around the fire at Cherry Creek Campground. One morning, I strolled toward the camp showers to charge my phone and eat a Poptart. Inside I found a stranger doing exactly the same thing and was surprised to hear he had also just arrived from North Dakota. He and a buddy hauled a couple motorbikes all the way down in the back of their pickup for a spring adventure. You gotta get away from the places you love sometimes, we decided -- especially home. How else could you ever return with something everybody needs? The boy walked slowly up the long shady drive to the small house behind the trees. Gang-sign graffiti covered its four walls and boarded windows. A massive pit bull stared from the porch as he ascended the stairs. The man emerging from the dark doorway held a shotgun at his side. The boy held out his hand, and the colors of the medicine wheel spun together in a cosmic manifestation of spiritual energy, as honest hand drum laid beat to soulful Ojibwe poetry all the way up to the street. "That's a wrap!" Tom cried, scratching Ogema behind the ears. "Or a rap. Maybe both." Thomas Barrett brought us to this quiet corner of the Red Lake Nation to film a video to accompany his Ojibwe-language hiphop music. Young Marlon stepped down from the porch to wash the red, yellow, black, and white paint off his palm. Rodney packed the unloaded shotgun away and turned again to look inside the house he grew up in. Mosquitoes floated in through the frame where the back door once stood. Shattered glass and squatters' clothes littered his old bedroom. Used syringes hid scattered on the kitchen floor. In the backyard, I filmed Marlon dancing in his people's ancient regalia. No matter how many mosquitoes covered his exposed skin, he would not stop dancing until we asked him to. Bug bites are worth getting when you're trying to empower your people. Most Red Lakers I know would take a lot worse. Our roles in serving our home are supposed to change as the environment changes around us. All we oughta do is encourage the ones that involve more dancing than misery making. One day, before I'd ever even heard of Red Lake, I was packing up to bolt out of class as usual, when I decided to introduce myself to our guest speaker, Red Lake Department of Natural Resources biologist Jay Husbey. He taught us about the collapse and recovery of the Red Lake walleye population in the 1990s, and I thanked him for sharing his amazing story with us. "Well if you wanna learn more about it, come on over any time," he said. "We'll show you around." So instead of studying for finals that semester, I drove to Red Lake with a friend to interview fisheries managers, tour the Red Lake Nation fishery, and realize that the community's connection with it's spiritual ecology and their actions to empower it are something to admire. We never finished editing the footage we created that weekend, but the friends we made on that first visit have become people I have trouble imagining my life without. The day we met Tom, we spent some time drawing signs for his music video, “Rezolution.” Then he drove us around the Red Lake Nation, interviewing his friends and film them holding the signs we made. In Redby, a small crowd gathered near the fishery building. The annual ice fishing derby was wrapping up, and soon they would judge the grandest walleye pulled out of the ice holes that morning. I squinted when Tom told me to drive out onto the lake. "Are you sure, dude?" I knew as a white man I would never go fishing on lower Red Lake. But how ought I feel about walking on top of it? "Drive," he said again, pointing to the bumpy snow-plowed paths on the frozen surface. My red 1998 Jeep Grand Cherokee Sharon and I have been many amazing places together. But no morning drive has been more meaningful to me than that short trip across the ice. We parked, and I almost slipped a dozen times trying to get my camera out of its bag. "Hey," someone shouted behind me, "no white guys allowed!" I turned with an uncertain expression on my face. "Just kidding!" he laughed. It was former tribal chairman Floyd Jourdain standing with Tom's dad. Both held signs in our video that read "Honor the Treaties" and "Sobriety is Tradition." Tom's mother Karen, whom I had never met, appeared and spoke to me with words I will never forget. "I'm so glad you're here," she promised. I was too. We returned from Red Lake to the Sandbagger House on a hockey weekend. I made it into the driveway before they closed off the road in front of our house and 11,000 people streamed out of the arena across the street. In front of the building on a high pedestal is a statue of Sitting Bull mounted on a horse. He was a Dakota hero killed by federal officers in a standoff at Standing Rock 127 years ago. His people taught Tom's people to play the hand drum. There's a heavy chalkboard we leave messages on sometimes standing in our yard by the driveway. I wasn't surprised to see it had been kicked over on a night with so many college kids in the street. If it weren't so heavy, I'm sure it would have been stolen long ago. "One People," it read that night, in the four colors of the medicine wheel. I stood it right and went inside, catching a glimpse of the mounted man above the crowd across the parking lot. Hearing shouts and liquored laughter, I glanced out the window. A group of young men loped ahead of their shivering dates on the sidewalk in front of our house. All wore the same image of Sitting Bull's face on their sweaters. None questioned the friend who kicked the chalkboard over once again. Most laughed. I smiled, too. I'd never seen the Empire so flooded with people. MeiLi Smith stood above them on stage like a sandbagger looking down from the edge of a trembling levee. She directed Faded, a film about kids we grew up with who have become casualties in the war on drugs. Some died a few weeks after graduation. Some died later. Some are in jail or addicted to things they can't get treatment for. The rest of us realize that nobody seems interested in helping the younger generations understand substance abuse with any real sincerity. If we allow "just say no" to control the conversation, the taboo will never break, and we'll never get well again. "Your stories will change lives," MeiLi reminded our fallen friends that night at the Empire. They already have. A video we made of the discussion panel following her film screening won a contest from the Newseum Institute in Washington, D.C., and MeiLi and I got to travel there to be interviewed about harm reduction in North Dakota. I wondered if I ought to have changed out of my ratty old sandbagger shoes as we walked into the glorious Newseum with the other assembled student filmmakers. We ate lunch in a boardroom overlooking the Capitol Building and Pennsylvania Avenue. A sign on the balcony said people used to keep their slaves in pens under the street there when they visited Capitol Hill. Gene was a gracious host, and I'm so grateful the Newseum had earned a grant to fly us all out to meet each other. We had much to discuss and another video to make together. I asked if I could record a little video of my own while the group chatted. "Well," he smiled, "it'd be hard to say, 'No pictures' in the house of free speech." Downstairs in the impressive Knight Studio, each group prepared to share their stories on camera. While they played our video, I counted the lights on the ceiling and wondered if my story would have played itself out this way had the stories of some of my friends not ended the way they did, too soon, because of something as simple as somebody losing count of the number of drinks they had. I can't remember just how I answered Gene's questions, but I know I said something about communication being both the problem and the solution when it comes to reducing substance abuse. When people’s grandparents feel they have to hide their addictions, we’ve got a big problem. Leaving the Newseum feels like walking out of freedom's front yard. You're amazed at what it's become, but you wonder what it will be when you come back. I crossed the street wondering what they'd be saying about harm reduction in the big pointy building down the avenue by the time I visited again. A year has passed since the sandbaggers spent spring break on the road with Mathodi. Twenty have passed since water amassed in the coulée banks and poured through the storm drains to drown Sandbagger Street in front of our house. 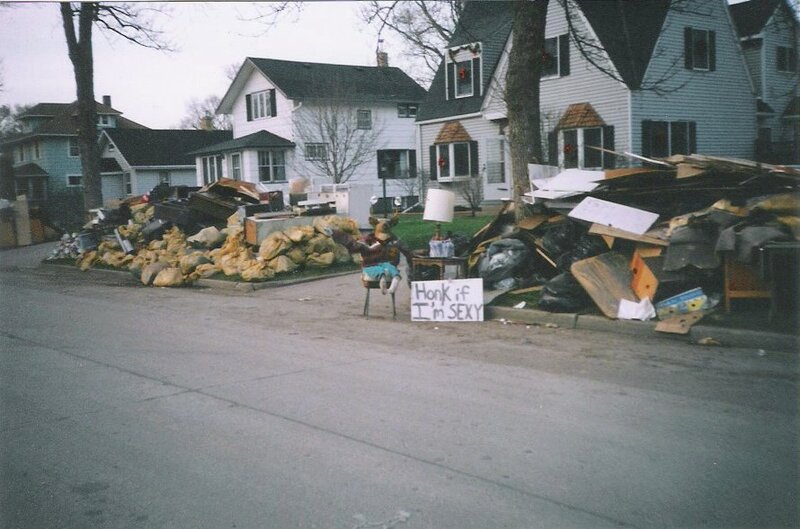 Our next-door neighbor Brad remembers the ‘97 flood. He was living in the basement at the time and lost everything he owned. If your idea of recovering from the flood was to run out and buy a bunch more new stuff, then he’d say you didn’t get the message. It was a gift to stand in uncluttered homes with room enough for once to know that all we’d need we’d never really would lose – the people we love and our ancestral roots. Brad worried about the newsman’s tendency to sound almost boastful of our community’s altruistic instincts, as if people elsewhere wouldn’t come together as we had in the face of emergency. "People come together everywhere," he said. We should be proud of it not because we have it, but because we can share it. As of this writing in March, the ND House of Representatives approved Tammy Sadek’s confidential informant reform bill with unanimous consent. Upon approval by the Senate, the governor promised to sign Andrew’s Law into effect and celebrate harm reduction as a tool to reduce drug use in our communities. When I dream today, it is of waking up beneath the sandbagger banner, stepping out into shin-high rising water, and tromping over to join my friends on the sandbag wall to scheme up some impossible plan and help save the town. So if you’re driving along one lonely night and suddenly see the Sandbagger News Van flying off the cliff, pay us no mind. We’re just sandbaggin’ ourselves off somewhere we oughta be – either at the bottom of the valley or someplace high among the far off stars.